Nicholas Demaio (Coronado) dished out nine assists and Quentin Buchman (Santa Margarita) scored five goals to lead the Under Armour West Highlight team to a 2-0 record after the first day of play. Demaio is the leading assistant thus far – no other player has more than three. Buchman ranks second amongst all Day 1 goal scorers. The West began the event with a statement 17-4 win over Upstate New York. 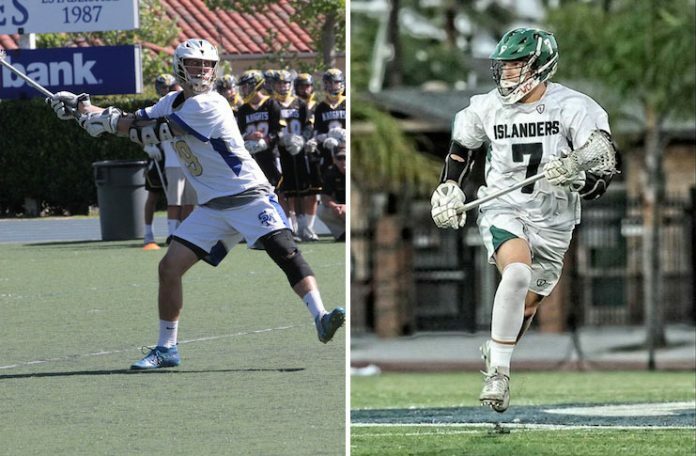 Southern Californians helping with offensive output included Demaio (1a), Buchman (2g), Justin Cheng (Beckman; 1a), Ryan Ramirez (Torrey Pines; 1g), and Isiah Dawson (Bishop’s 2g). Torrey Pines’ Makail Fraboni had three saves between the pipes. In game two, the West needed every single one of Demaio’s eight assists to scratch out the 10-9 win over the South. Buchman notched a hat trick and Ellis Geis (Foothill) found the back of the net twice. Long poles Cheng (1g) and Hayden Rodenbeck (Servite; 1a) displayed their versatility by helping out on offense. Fraboni had one save. Pool play continues today with games against Baltimore (2-0) at 11:30 eastern and New England (1-1) at 2:00 pm eastern.